If you're a fan of relaxed dressing when it comes to fashion, you'll love this adorable pairing of a grey denim jacket and a charcoal skater skirt. Kick up the cool of your getup by rounding it off with Marsèll flat ankle boots. If you're on the lookout for a casual yet totally chic getup, opt for a beige trenchcoat and light blue ripped skinny jeans. Both garments are totally comfy and will look fabulous paired together. You could perhaps get a little creative when it comes to footwear and lift up your look with Marsèll flat ankle boots. If you're all about practicality dressing when it comes to your personal style, you'll love this super cute combination of a grey crew-neck sweater and a black and white horizontal striped mini skirt. Kick up the cool of your look by completing it with Marsèll flat ankle boots. If you're after a casual yet totally stylish ensemble, make a light blue coat and white skinny jeans your outfit choice. Both garments are totally comfy and will look fabulous together. 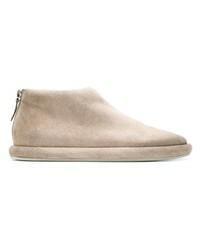 When it comes to footwear, this outfit is complemented nicely with Marsèll flat ankle boots from farfetch.com. If you're after a casual yet absolutely chic getup, consider pairing a black silk dress shirt with blue jeans. Both items are totally comfy and will look fabulous paired together. 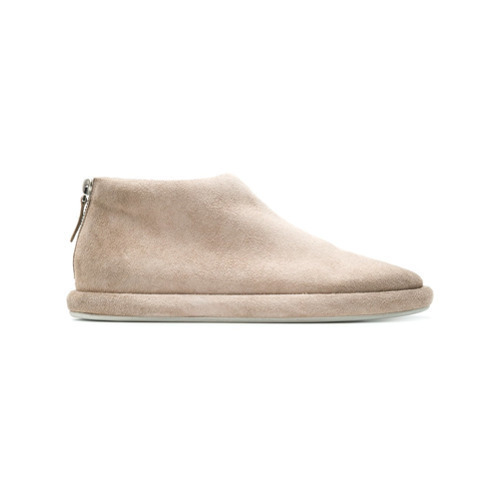 When it comes to footwear, this getup is finished off wonderfully with Marsèll flat ankle boots. If you're all about functionality dressing when it comes to your personal style, you'll love this extra adorable combination of a tan oversized sweater and black ripped skinny jeans. 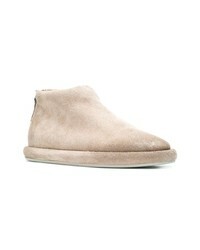 To add oomph to your outfit, finish off with Marsèll flat ankle boots from farfetch.com. Marry a beige knit oversized sweater with white ripped jeans to be both casual and cool. And if you want to instantly up the style ante of your look with one piece, add Marsèll flat ankle boots to the equation. If you're on the lookout for a casual yet totally stylish getup, choose a white knit turtleneck and a white shirtdress. Both items are totally comfy and will look fabulous together. Amp up the cool of your look by wearing Marsèll flat ankle boots. Such items as a grey cape coat and a grey shift dress are the perfect way to introduce some totally stylish into your day-to-day collection. Marsèll flat ankle boots complement this getup quite well.